Application support is crucial in ensuring that our Client Service team has the technology and support to deliver value to our clients everyday. 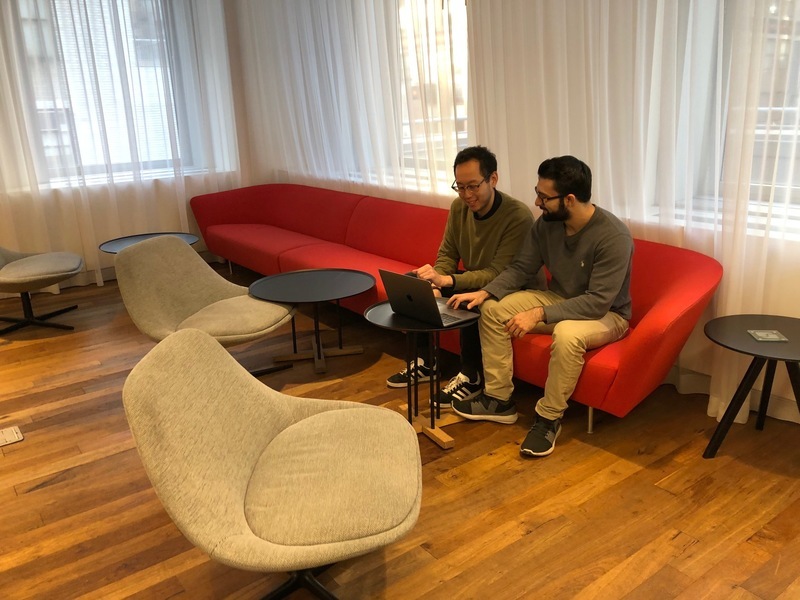 We sat down with App Support engineers, Haris and Justin, to learn more about the growing team. Can you tell us a little about your background and how you found your current role at AlphaSights? Justin: I graduated from Pace University in 2018 with a degree in Information Technology. I concentrated in Web and Digital Media because I could explore web development, user experience, and digital design while learning about traditional IT subjects such as networking and security. Before AlphaSights, I worked in real estate and while I was pursuing my degree, I worked at Apple as a Technical Specialist and with Porsche as part of their Research and Development team for urban mobility innovation. I had a variety of interests and experiences and I wanted to find a company that tied them all together. The Application Support role at AlphaSights was exactly what I was looking for. I knew that I wanted to work here after meeting Ollie Stephenson, VP of Global Operations. During our conversation, he was extremely engaged, wanted to hear my story, and really understood who I was as a person. Haris: I initially started college as a pre-med student at Rutgers University. Though I pursued a pre-med path, I always had technology in the back of my mind. I grew up surrounded by video games, computers, and other types of electronic devices, sparking a passion for technology and a fascination in understanding how different devices work. I quickly realized pre-med wasn’t the path for me and switched into an Electrical and Computer Engineering program at Rutgers School of Engineering. I graduated in 2016 with my Bachelor’s degree and began working at a consulting firm as a software developer, primarily focusing on application support and vendor management. After some time, I realized the role wasn’t quite right for me and took some time off to focus on personal development. In May 2018, I stumbled upon a Glassdoor listing for AlphaSights. I was intrigued and applied for an Application Support role. I met Steve Scher, Technical Operations manager, and Ed Warren, software engineer, during my interviews and was immediately sold. The passion with which AlphaSights employees carry out their work is contagious, the energy from the most junior and senior members is invigorating, and the office environment felt professional yet welcoming. I’ve loved working here each day alongside my peers. What are some of the best and most challenging parts of your role? Haris: The best part of my job is the autonomy to resolve issues for end users and immediately receive feedback. Helping someone else succeed in their daily work is an incredible feeling and in turn it provides an amazing sense of self accomplishment. When I first started in app support at AlphaSights, I was the only person in the role. There were a lot of challenges in the beginning between learning the business, identifying key stakeholders, and deciding what projects to prioritize first. Luckily I had a lot of support from my colleagues and quickly ramped up. Overall, I think the most challenging aspect of my job is keeping up with software changes that the Software Engineering team makes, while understanding our proprietary software’s historic behaviors. We often find answers to questions which may not initially exist! It’s a great opportunity to think critically and problem solve. Justin: The best part about my day-to-day is that it’s always different! Providing support for AlphaSights’ internal software is challenging, but rewarding; I learn something new everyday. I work with the Software Engineering and Product teams to provide insight on any issues or opportunities for improvement. The most exciting aspect is taking all of the knowledge I acquire and turning it into a learning opportunity for the rest of the firm. I enjoy creating and managing internal training documents and sessions that are used by the rest of the AlphaSights team. What makes working in your role at AlphaSights unique compared to other companies? Justin: App support at AlphaSights is different because it’s so multidimensional. The role doesn’t just involve providing support; we constantly work to improve or implement new methods that make processes or applications better through a variety of channels. The role is highly collaborative and provides many opportunities for personal growth! How have you seen yourself grow and develop during your time at AlphaSights? Haris: The most crucial skills for an App Support Engineer are communication, empathy, a solid understanding of information systems and flow of digital information, and a desire for uncovering unknowns. I feel I’ve expanded on all of these skills since starting here at AlphaSights. I always saw myself as someone with strong communication skills, empathy, and a fair attraction to puzzles, however, my understanding of systems and information flow in a real world context was limited prior to my role here. Fortunately, through reading various materials and knowledge transfer from colleagues, I’ve learned so much in such a short time. Justin: I constantly receive feedback from my team and I love it. It’s great to receive kudos, but more importantly, I really value understanding areas in which I can improve. Working in such a dynamic atmosphere, I’m able to develop and improve my customer experience, user experience, and coding abilities. I also enjoy being exposed to different workflows and styles that focus on teamwork, communication, feedback, collaboration, and scalability. Can you tell us where you see the team in the future? Haris: In the next few years, I see App Support becoming a well-established team and keeping pace with AlphaSights’ rapid growth as a firm. The role itself will most likely expand by working closer with Software Engineering to provide them direct user feedback, which helps the team meet the needs of the larger organization. Our team’s goal is to take on more responsibility and manage more senior-level assets and vendor relationships. In order to achieve this goal, I meet with my manager bi-weekly to highlight areas of potential growth and ownership as well as relevant Software Engineers to bridge any knowledge gaps and facilitate knowledge transfer between our teams. I tend to create action points as a result of these meetings and execute thereafter. Haris Samim joined AlphaSights in June of 2018 and Justin Kwok joined in November of 2018. Both serve as Application Support Engineers on our Operations team.